Our Business Online Banking was recently converted to a new system which includes separate options for Small Business and Commercial customers. Current Business Online Banking customers were moved to the new systems the weekend of February 9-10. For Businesses who use only Business Online Banking and/or Bill Pay, you will be logging into our new Business Online Banking. Click the link below for details and important instructions. For Businesses who use any of our Treasury Management Services including ACH, Positive Pay, Remote Deposit, Fraud Filter or Wires, you will be logging into our new Commercial Online Banking. For International Customers who access their personal accounts through Business Online Banking, your Online Banking System will remain unchanged at this time. 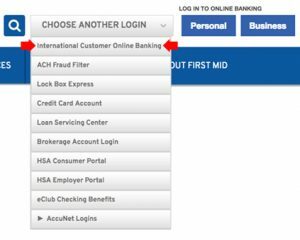 To access your account, you will need to click “Choose Another Login” then select “International Customer Online Banking” to be directed to your login screen.